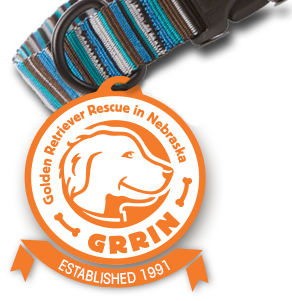 Lexi initially entered GRRIN in March of 2008 when she was 6 years old. Her calm demeanor and gentle soul immediately made an impact on Stacy and Bryan. It became obvious to everyone that she would make a great addition to their family. She quickly fell in step with their routine as they soon welcomed their third daughter. Lexi watched over the girls like a “stepmom”. In early summer of 2009, Lexi started limping, and her vet gave her some shots and pills to help alleviate the pain and reduce inflammation. They thought that she might have strained a ligament because she bounced back to her normal self in 1-2 days. In September of 2009, Lexi started limping again, and within 3 days she couldn’t walk. 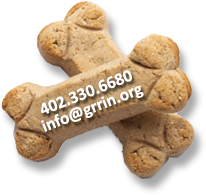 Due to an extreme financial hardship resulting from the recent cancer treatment of their other dog, Stacy and Bryan reached out to GRRIN for assistance. We coordinated an examination with X-rays at the vet, and a subsequent consultation with the Midwest Vet Specialty Hospital. Lexi’s diagnosis revealed that she had spinal issues that were unlikely to improve with surgery. The decision was made to release her from her discomfort and help her cross the Rainbow Bridge. Stacy and Bryan were by her side to let her know that she was loved. Lexi’s ashes are spread in a grassy pasture where Golden Retrievers regularly run and play, an appropriate resting place for a sweet girl with a sunny disposition. She’ll always be remembered fondly by everyone who was lucky enough to know her.